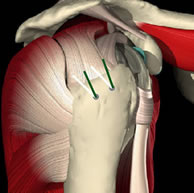 Shoulder arthroscopy is used for rotator cuff repair. Rotator cuff repair is surgery that repairs a torn tendon in the shoulder (tendons connect muscle to bone). The rotator cuff is a group of muscles and tendons that form a "cuff" over the shoulder, keeping the arm in the ball-and-socket joint and helping the shoulder to rotate. The name of the tendon in the shoulder is the "rotator cuff tendon." Rotator cuff tendon injuries most commonly occur due to the wear and tear associated with aging. Often, what appears as a minor injury causes the tendon to give way. On occasion, a single injury will cause the problem. Dr. Mendez will recommend rotator cuff repair if you experience pain when using your arm in positions over your head, weakness in the arm, or chronic inflammation around the rotator cuff. Surgery may be recommended after nonoperative treatment consisting of physical therapy and medication. In the majority of cases, tendon repair is possible. About five percent of the time, this is not possible. In this situation, the removal of inflammation, scar tissue and bone spurs helps to diminish the pain but overhead use usually does not return to normal. Rarely will the condition improve without surgery when the tendon tears. Most often, the pain increases and the movement and strength decrease. Fortunately, this usually occurs slowly over the years. Surgery is performed to suture the torn tendon ends to the bone. During surgery, Dr. Mendez also will remove any inflamed bursa or bone spurs that would delay tendon healing. General anesthesia is used during the surgery. At the end of the operation Dr. Mendez will give you an injection of a type of novocaine around the nerve that goes to the shoulder. This lasts 4-24 hours and will help decrease your pain after the surgery. Following surgery you will awaken in the recovery room with your arm in a sling. An ice pack called a Cyro Cuff is used to control the pain and swelling. You will remain in the recovery room for two to three hours and then go home. During shoulder arthroscopy, a small camera, called an arthroscope, is inserted near the shoulder joint through a small (usually one-quarter inch) incision. The arthroscope is attached to a video monitor to allow Dr. Mendez to look inside your joint. Instead of making a large incision, Dr. Mendez uses three small (about 1/3") incisions. Through one incision, he inserts the arthroscope to look inside your shoulder. He inserts special instruments that allow the removal of scar tissue and bone through the other two incisions. Dr. Mendez will then insert small metal screws into the shoulder. There are sutures attached to the eyelets of the screws. We use special instruments to weave the sutures through the torn tendon. The screws are inside the bone and you cannot feel them. They do not have to be removed. The screws will not set off airport sensors. 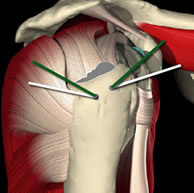 Surgery to repair a torn rotator cuff is almost always successful in alleviating shoulder pain. 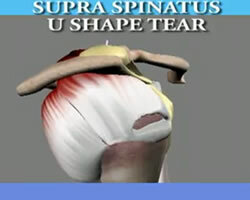 Returning strength to the shoulder is more difficult to guarantee. This type of surgery is successful about 85-95% of the time. No shoulder operation is 100% successful in every individual but the procedures we perform are reliable and will help restore the potential function in your shoulder. Because of the many variables involved, I can make no guarantees other than to assure you I will deliver the very best medical care possible. Your first office visit is 1 week after surgery so that Dr. Mendez can examine the surgical incision. He will give you additional instructions for exercises and discuss your allowed activity level. Six weeks after surgery, more vigorous use of the shoulder will be allowed. Office visits then occur 3, 6 and 12 months after your surgery. For most sedentary jobs, Dr. Mendez recommends taking a week off from work. When you return to work your arm will be in a sling (for 4 weeks after surgery), but you should be able to manage as long as you do no lifting, pushing, pulling or carrying. You are not to raise your arm without help for four weeks after surgery. This allows the tendon to heal in the best possible position. You may begin light duty work involving no lifting, pushing, pulling or carrying, within two weeks after surgery; you may work at waist level and lift 5-10 pounds 2-3 months after surgery. Most patients can tolerate occasional work at shoulder level 3-4 months after surgery, but a return to heavy lifting or overhead use may require 4-8 months. You will do a simple exercise for 2 minutes, 5 times a day. 10 Minutes of daily rehabilitation that you can do yourself at home is all that is needed. You will start formal physical therapy one week after surgery. Formal therapy is once or twice a week for a period of about 3 months. The most common complication from rotator cuff repair involves the loosening of the bone screws (suture anchors), which occurs in less than 1% of patients. Dr. Mendez uses these small implants to reattach the torn tendons. There is always a possibility they would have to be removed surgically if they loosen or cause irritation. Wound problems including swelling, bleeding, delayed healing, unsightly or painful scars. Joint problems including stiffness or arthritis could occur. Failure to achieve the desired result is not strictly a complication but it can be a source of disappointment. This operation may result in incomplete motion, strength or function. Nerve injury is extremely rare but may result in temporary or permanent, partial or complete loss of feeling and/or movement.